Woolf remains uncracked: Holly Williams on a pair of monologues exploring two very different historical women’s lives. In 1973, Maureen Duffy wrote A Nightingale in Bloomsbury Square, a one-woman play scooping out the biography of Virginia Woolf. As she prepares to commit suicide, the writer looks back over her life, talking to the audience about her relationships with Leonard Woolf, Vita Sackville-West, her parents and sister; her madness, her lack of children, and her writing. It also circles around a real-life encounter with Freud: he once gave Woolf a narcissus. It’s a perfect detail for a playwright to pick up on. But for all this portrayal shows Woolf as wryly sceptical of Freud (first published in Britain by the Woolfs’ own Hogarth Press), Duffy does trot her down several psychoanalytic pathways: suggesting Woolf used her writing as a way to “kill” her parents, or to sublimate her desire for children. Some biographical interpretations seem a bit much, frankly: suggesting Leonard forbid Woolf from having children as a punishment for her being cold in bed, for instance. Interest in Woolf’s dramatic private life has hardly waned since the Seventies, and her story has surely become more familiar (certainly, there were plenty of self-satisfied, I-get-it hums, of the sort you more normally hear at impenetrable Shakespearean jokes, from this audience of presumed Bloomsburyites). There are odd moments of clanking exposition, but for the most part Duffy is both sharp-eyed and elegant in her condensing and skipping around a life stuffed with incident, as vibrant as it was anguished. Her writing style is frequently poetic (here’s Vita, “glowing like your own deep red velvet self”) without veering too far into pastiche. Unfortunately, Sarah Crowden is not really up to the task of inhabiting Woolf. She stumbles on words, has to be prompted. Under Natasha Rickman’s direction, she doesn’t look terribly comfortable moving around Verity Johnson’s set, a book-lined study painted a nasty, dribbly green (presumably meant to evoke Woolf’s watery death). But the real problem is the pace: you feel you’re watching someone trying to rattle through lines, rather than spontaneously thinking aloud. The stream of consciousness just streams by too fast to catch any truth. In occasional moments, Crowden will capture some of Woolf’s contradictions – her hauteur or her fear, her high spirits or her spite – but too often it all sounds stagey and rather precious. “I like to go and crack people’s bones at parties to taste the pith of them,” Duffy has Woolf say. But that visceral fierceness never breaks through in this etiolated production. Woolf remains uncracked. 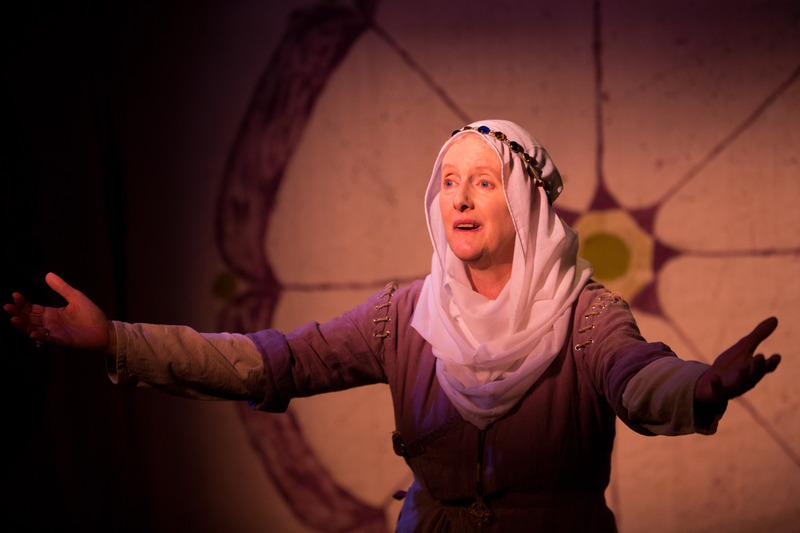 A Nightingale… is presented in a double-bill with The Choice, another monologue, about Hilda of Whitby, whose abbey was the site of the Synod of Whitby in 664AD, where the King had to choose to follow Celtic or Roman Catholicism. Hilda, steeped in the Celtic tradition, prefers its simplicity to the pomp and bling of “the Roman way”; her conviction of this is more persuasive, really, than her final decision to attempt to unite the church. She’s another strong woman, but this chapter of theological history is a wee bit dry, although Crowden finds some wonder in tales of miraculous singing, and some feistiness in Hilda’s resistance to imposing men. A medieval Abbess and a modernist writer may seem to have little in common, but here both stand up to louder, stronger male narratives, insisting instead on the validity of their own stories. Hilda and Virginia is on at Jermyn Street Theatre until 3rd March. Book tickets here. Holly is an freelance journalist and staff critic for What's on Stage. She was lead arts writer for the Independent on Sunday before its demise, and has since written for Time Out, The Stage, the BBC, The Observer, the TLS, Elle and The Telegraph, among others. She hails from Wales, but lives in London. There's more here: hollywrites.com.